While Beauty & Style Director Lisa Oxenham and I are more than thrilled to be shooting on a beautiful beach at the Constance Ephelia resort in the Seychelles, the first airing of lily white limbs is just a touch traumatic. Beyond the embarrassment of getting our rather unprepared bodies out (which is in this case especially pronounced as we’ve hit the beach with the vision of gorgeousness that is Jessica Gomes) is the issue of what to take in our bags for an entire day at the beach – we need to make sure that we don’t burn, that our skin doesn’t dehydrate in the sun and ideally are aiming to look chicly glowing, not a sweaty mess. LA ROCHE-POSAY ANTHELIOS COMFORT 50+: Packing a La Roche-Posay suncream is always a good idea; rarely do their formulas irritate skin and their spray on oils in high SPFs are ideal for on-the-go application and simultaneously making legs look slightly sheeny and therefore longer. LANCASTER SUN SPORT INVISIBLE WET MIST SPF 30: It’s never a bad idea to have two suncreams on the go. Where the factor 50 isn’t needed, this one steps in. We particularly like the fine mist, which does away with the need to to try commandeer someone to rub it into hard-to-reach places. ULTRASUN DAILY UV HAIR PROTECTOR: If we’re being honest, we’re as into those sneaky highlights courtesy of a day at the beach as anyone but – and it’s a big but – frazzling already-highlighted pieces is a big no-no. We use this to protect those bits. GUINOT ANTI-AGEING EYE CONTOUR SUNCARE SPF 30 & SUNSCREEN LIP BALM SPF 20: The skin around eyes and on lips is particularly delicate and therefore prone to burning. These two are safeguarding ours. 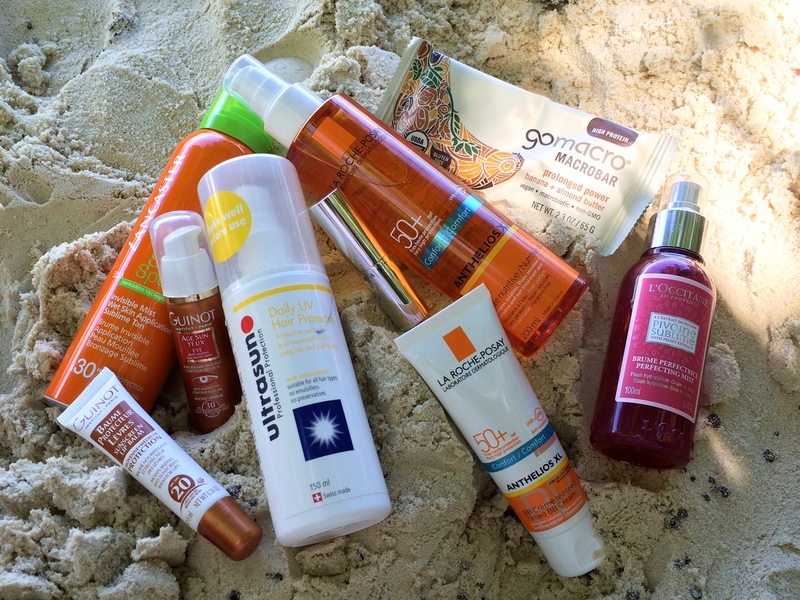 LA ROCHE-POSAY ANTHELIOS 50+ BB CREAM: Did we mention we’re on the beach with a supermodel? A bare and pale face just won’t do. Instead, we’re getting our protection along with a nice shot of believable bronze. FYI: this stays put all day without streaking. L’OCCITANE PERFECTING MIST: There will ALWAYS come a moment when beachside when you wish you had a hydrating face spray. We’re always prepared for those flustered, sweaty moments with this mist, which has the added bonus of smelling really quite marvellous. CHANTECAILLE LIP SCREEN TINT SPF 15 I SARDINIA: A little tint, a little SPF, a lotta moisture. This is ideal for lipstick fans among you who want to make things a little more natural for the beach. In a moment of idiocy, this was left in the sun while we splashed about and we can therefore attest that it’s a good ‘un for your beach bag as it doesn’t melt as a waxy lipstick would. GO MACRO MACROBAR: Alright, alright, this isn’t the most fun of inclusions but it was the most appreciated when energy levels were dipping. If you tend to get the munchies mid-afternoon, try one of these for a satisfying boost.